Convenient 3-pack gives you just the number of report covers you need! Versatile report covers hold presentations, papers and reports firmly in place - documents stay protected. 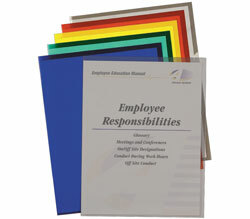 Clear covers come with assorted 1/8 inch binding bars (backbones). Binding bars come in White, Blue and Black. For 8 1/2 x 11 materials. Vinyl. 3/PK.